With tenants harder to come by, landlords are turning to tourists for investment income. How do the numbers work out? We give you the Guru View. Short term rentals, defined as leases below six months in length, are technically illegal. While the Urban Redevelopment Authority is currently re-examining its short term lease policy, many homeowners have already started renting out their properties to tourists using services like Airbnb and Tujia. More often than not, residential homes have taken over the roles of hotels, and are providing tourists a place of lodging during their travels. There are a number of push and pull factors that have led homeowners to adopt this model, rather than staying with traditional one- or two-year leases to longer term tenants. For the purpose of analysis, we will only be looking at private non-landed residential homes, which a quick survey of Airbnb and Tujia reveal, is the majority of the short term properties available for lease here. Sentiment in the real estate market is in the doldrums currently, with the private non-residential rental segment taking a hit as well. 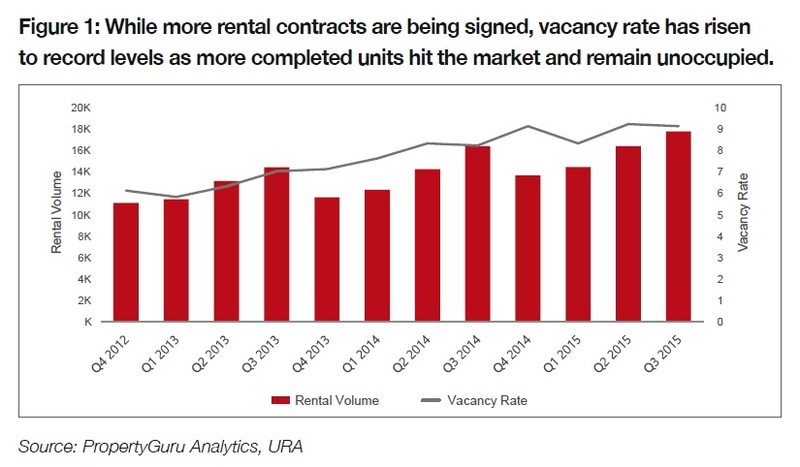 Figure 1 shows the movement of rental volumes over the past 12 quarters in a general upward direction. This is deceptively positive. While this does indicates tenant demand, the situation is a little more complex. Even as rental volumes have increased, so too has the vacancy rate (Figure 1, right-hand side axis). In Q2 2015, the vacancy rate for non-landed private residential homes reached a record 9.2 percent, before dipping slightly to 9.1 percent in the last quarter. What these two data points suggest is that existing demand, while at a relatively high level, is unable to absorb the supply coming on stream. On the ground, we are also hearing that a number of condominium units that sold exceeding well due to their investment potential three or four years ago are now facing stiff competition for tenants, with landlords in a race to the bottom dollar to secure agreements. The supply side situation is likely to exacerbate further in 2016, with over 20,000 more private non-landed residential units set to complete construction. Furthermore, the prognosis for the rental market is far from rosy. A slowing global economy does not bode well for trade in exports reliant Singapore, and it is unlikely we will see an increase in companies setting up their regional headquarters here. This would also imply a slowdown in the arrival of expatriates and their families, which would lead to a weakening of demand for rental units. Given this, savvy landlords began to turn to another population other than tenants to occupy their empty units, with tourists stepping in to fill the gaps. 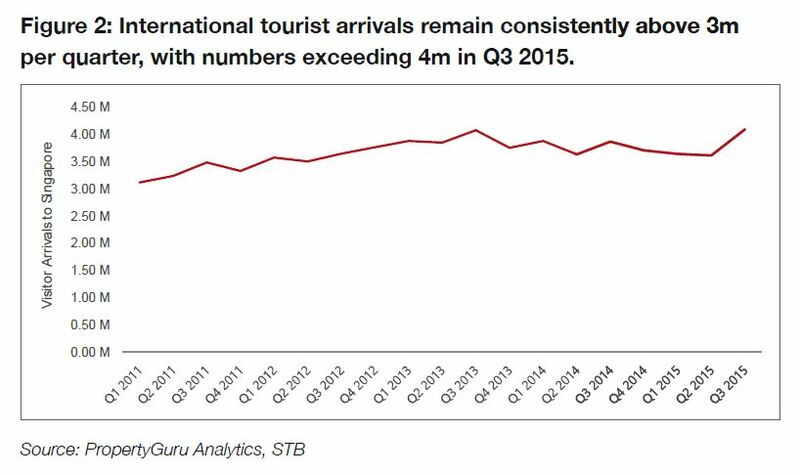 We compiled Singapore Tourism Board’s (STB) international tourist arrivals in Singapore over the past 18 quarters. Figures have remained consistently above the 3 million level each quarter, and just crossed 4 million in the third quarter of this year (Figure 2), the quarter we traditionally see arrival peaks each year. The consistency of tourist arrivals, enabled by disruptive Internet services, provides landlords a solution to monetize the excess capacity available, without the high operational costs and risks a hotel operator would face. Using these services, landlords are able to charge less per night than a regular hotel, undercutting them in price, while promising a more authentic experience. Furthermore, switching to this model also cuts out the real estate agent, which saves on commission charges for landlords. However, there are other costs involved with this model as well, with both Airbnb and Tujia charging a service fees. Landlords would probably need to pay more in maintenance with more wear and tear, and cleaning costs associated with shorter-term rentals. One of the attractions of switching to this model, even if landlords were able to find long-term tenants easily, is the promise of higher rental yields. Let’s run some numbers and see if this bears out. Let’s take a hypothetical 800-sq ft, two-bedroom residential apartment bought at $1M. If the homeowner were to fully qualify for the maximum loan-to-value ratio (LTV) and loan tenure, the loan amount would be $800,000 over a 30-year mortgage. We will assume an interest rate of 1.2 percent. According to PropertyGuru’s mortgage repayment calculator, this will work out to be a monthly payment of $2,647 a month. We will also assume a monthly maintenance of about $453 on the condo unit as well, which brings the total expected monthly outlay to $3,100. At the current median rental price of $3.45 per square foot per month, the homeowner can ask for a market rate of about $2,760 per month. While on paper, gross rental yields would work out to be about 3.3 percent per annum, in real terms, the homeowner would be paying $4,080 each year out of pocket. On top of this, the homeowner would also have paid his / her real estate agent a standard one month’s commission of $2,760 as well, bringing the total annual outlay to $6,840 per year. If the homeowner wants to avoid having negative cash flow each month, and asks for $3,100 in rents, the tenant would be paying $3.88 per square foot per month, 12 percent above the current median. This is not necessarily unattainable, especially if the unit is newer, and in a good location. This rate will not cover the agent’s commission either, which the homeowner will continue to pay out of pocket. Airbnb estimates that homeowners in Singapore can earn about $1,882 per week if they were to rent out their entire apartment to a maximum of four guests, or about $268 per night. If we assume that the apartment was only occupied for half the month, or 15 days out of 30, the rental income after Airbnb’s three percent service fee is about $3,912. The gross annual yield hence would be about 4.7 percent, and the homeowner would receive a passive income of $812 per month. Even if the homeowner were to incur an extra $100 per week for cleaning and maintenance charges, there would still be a positive cash flow of $412. Just looking at the numbers, short term rentals can provide better yields than regular long term leases. However, the homeowner will also take on more risk by choosing this particular model for investment income. While Airbnb does provide a $1.2M guarantee for loss and damages to homeowners, it will not cover wear and tear, which is likely to be higher with a short-term rental model. Furthermore, tourism arrivals are seasonal, and there is no guarantee of a consistent occupancy rate of even 50 percent throughout the year. Homeowners might, therefore, need a certain degree of reserves to tide them through the lull months instead of counting on rental income. Not every particular private property can use the short term rental model successfully as well. While tourists might arrive in Singapore by the millions per quarter, they are unlikely to want to stay in further flung suburban areas with longer commutes to tourist attractions and shopping destinations. Most of the properties available on Airbnb currently are either within the city core, or interesting city fringe areas, like Marine Parade, Geylang and Tiong Bahru. While the short term rental model could be a viable alternative for homeowners to earn some investment income in a weak rental market, it is very clear that what makes a home attractive to long term tenants, i.e., proximity to transportation, amenities, and the city center, are the same factors that would make them successful long term rentals. However, homeowners and landlords do need to keep in mind that this is still technically illegal, and they could face legal consequences if caught. This entry was posted in Landlord, Rental / Lease, Tenant and tagged Airbnb, landlords, short term lease, Short term rentals, tenants, Tujia. Bookmark the permalink.